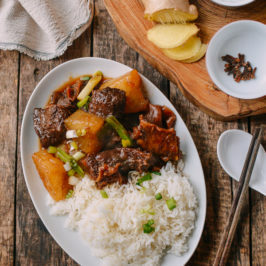 Cantonese Beef Stew is a dish that always popped in and out of my childhood. Sometimes it would be bubbling away in a clay pot at a Chinatown restaurant, and sometimes it was scooped out of a big pot at home. 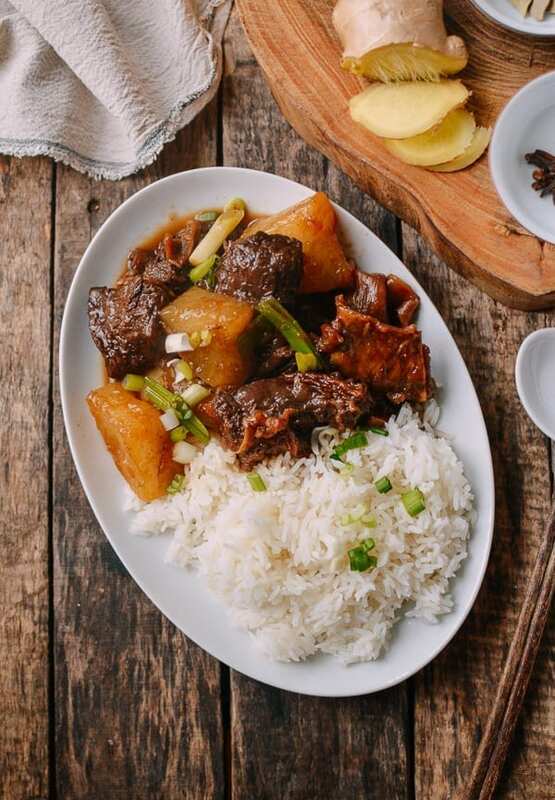 The tender, gelatinous pieces of beef and melt-in-your-mouth chunks of radish in a thin gravy, served over rice? Total comfort food. 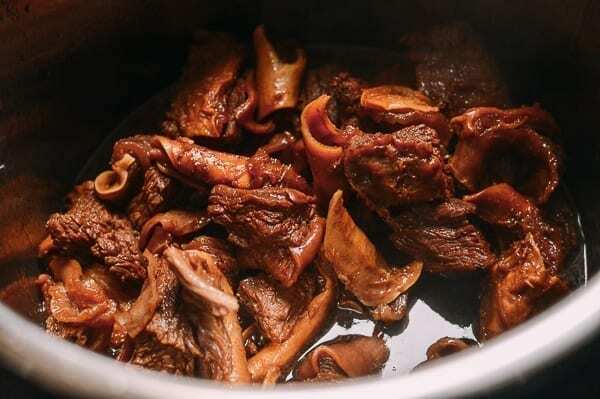 This Instant Pot Braised Beef with Radish is my shortcut pressure cooker version, with a few tweaks and improvements from the original Cantonese braised beef recipe we posted back in the early days of the blog. My dad’s family is Cantonese, and my mom’s side of the family is from Shanghai. 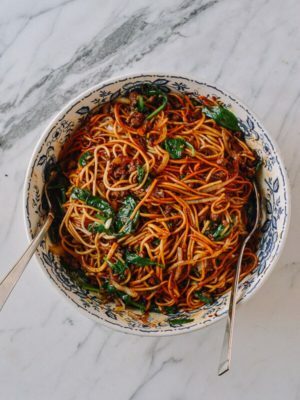 While my sister and I grew up eating dishes from both cuisines, my mom once asked us…if we had to choose, which would we rather have? A table filled with Shanghainese classics like braised pork belly, soup dumplings (xiao long bao), drunken chicken, and scallion oil noodles? Or a table of Cantonese classics like Salt and Pepper Pork Chops, steamed whole fish, and this braised beef with radish? 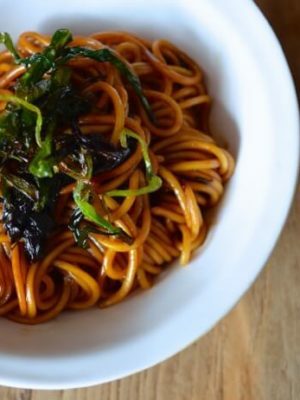 While I have a special place in my heart reserved for xiao long bao, and my sister is obsessed with scallion oil noodles, we both sheepishly turned to each other and said, back-against-the-wall, we’d choose the Cantonese table. 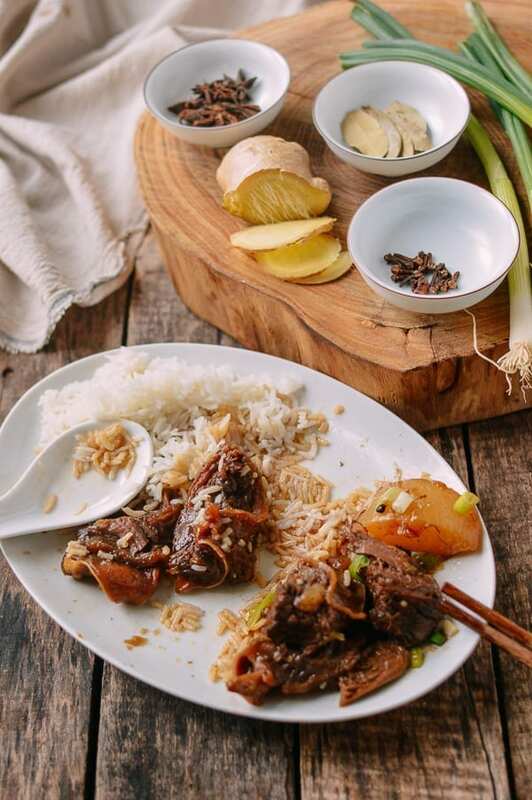 There’s just something particularly homey and comforting about Cantonese food, especially saucy things over rice, like this Instant Pot Braised Beef with Radish. There’s just nothing better. 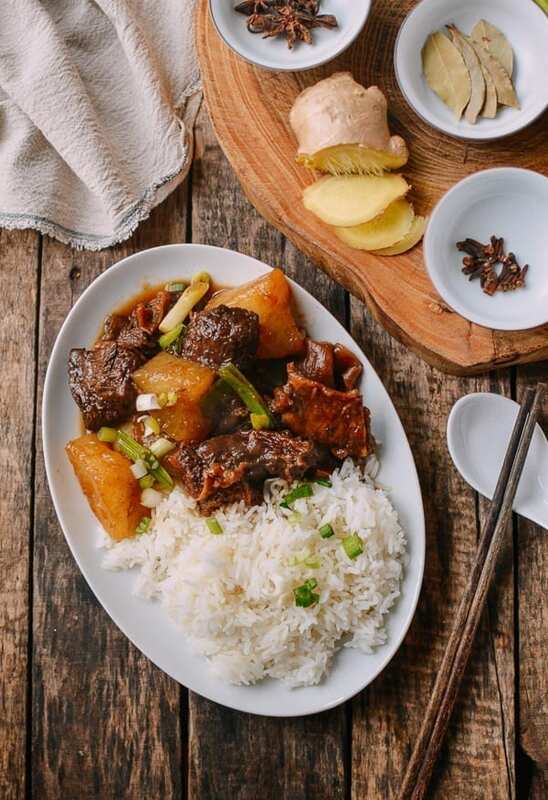 Which is why, now that I’m officially an Instant Pot convert, I decided to create a pressure cooker Cantonese braised beef with radish recipe. 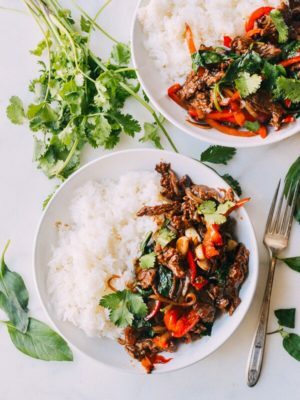 Like my Instant Pot Curry Beef recipe, this recipe uses a cut of beef called rough flank (niu nan in Mandarin, or ngau lam in Cantonese). 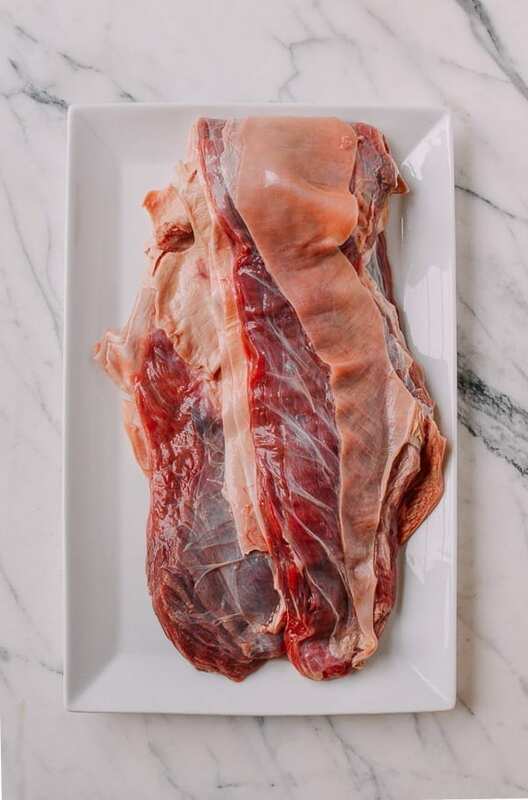 It’s a pretty tough cut of meat, full of tendony, sinewy, and gristly bits that when cooked for hours, all work together to produce a delicious texture. We cut them into pretty big, 2 1/2 inch chunks, as you can see below, because they’ll shrink when cooked. 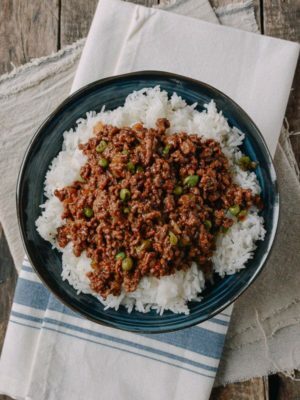 The Instant Pot helps tenderize that tough cut of meat in much less time, which is key when you’re looking for a comfort food dinner and may not have 4-6 hours to make it. Use a slotted spoon to remove the beef to a colander, and rinse. Set aside. Heat 2 tablespoons vegetable oil in your Instant Pot on the saute setting. 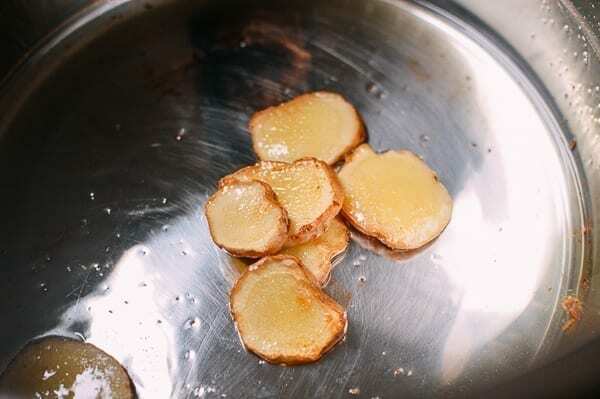 Add the fresh ginger slices, and cook for 2-3 minutes, until fragrant and slightly crisped at the edges. 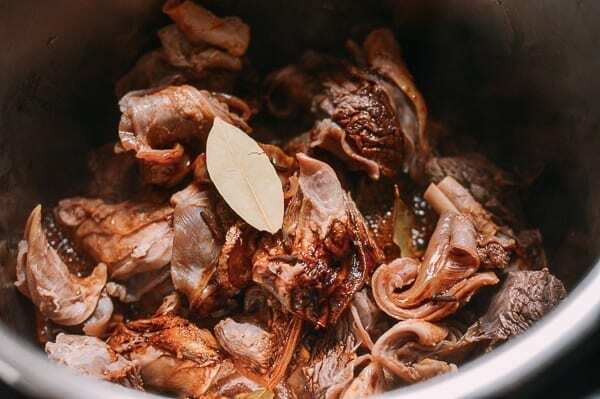 Add the blanched beef, Shaoxing wine, light soy sauce, dark soy sauce, oyster sauce, 3 star anise, 5 cloves, 3 bay leaves, and 1 tablespoon sugar. 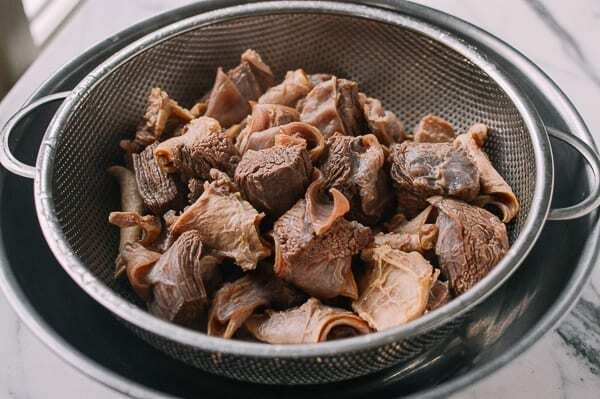 Seal the Instant Pot, make sure the valve is set to “sealing,” and turn on the meat/stew for 35 minutes. The float valve on the top of the Instant Pot will raise when under pressure. Next, add the radish chunks. Stir to combine with the beef. Replace the lid, seal the Instant Pot, move the valve back to the sealing position, and put it back on manual high pressure for 10 minutes. Once done, allow the pressure to release again using Quick Pressure Release this time (be careful moving the valve, as the steam released will be very hot. Use an oven mitt!). Open the pot when safe. Turn on the saute setting and bring the stew to a simmer. Mix together chicken stock or water and cornstarch into a slurry and stir into the stew to thicken. Simmer for 2 minutes, season with salt to taste, and stir in the scallions. 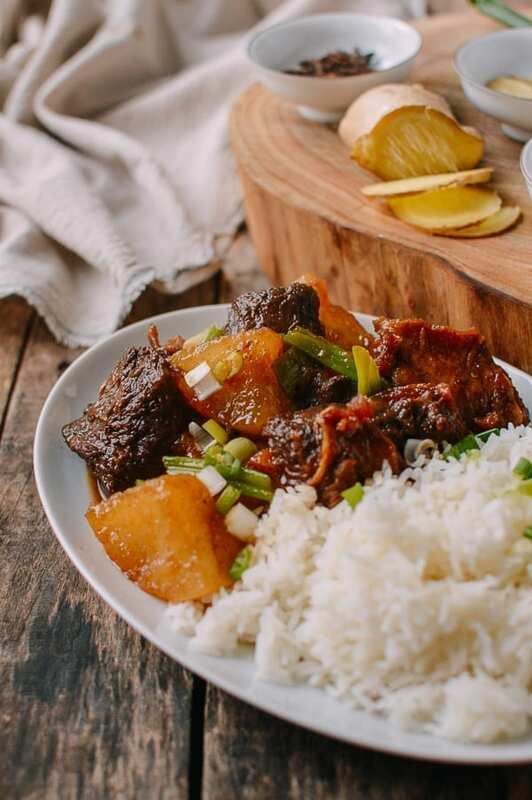 Serve your Instant Pot braised beef with rice! 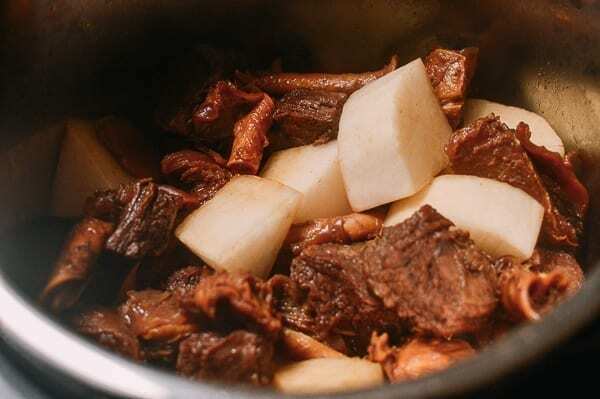 This Instant Pot Braised Beef with Radish is a pressure cooker version of a classic Cantonese Beef Stew with Daikon, done in less than 2 hours. Bring a pot or large wok of water to a boil. 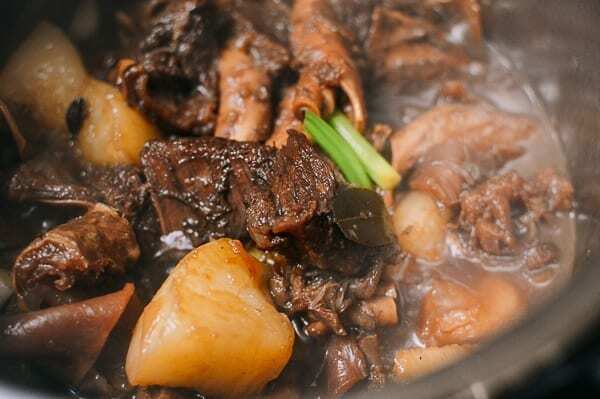 Blanch the beef chunks to remove any impurities. Use a slotted spoon to remove the beef to a colander, and rinse. Set aside. Heat 2 tablespoons vegetable oil in your Instant Pot on the saute setting. Add the ginger slices, and cook for 2-3 minutes, until fragrant and slightly crisped at the edges. 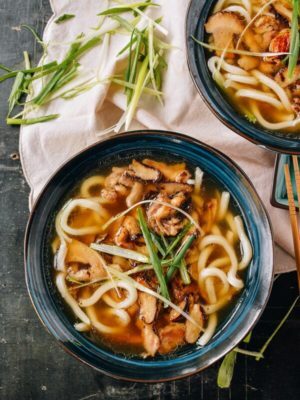 Once finished, allow the Instant Pot to release pressure naturally. 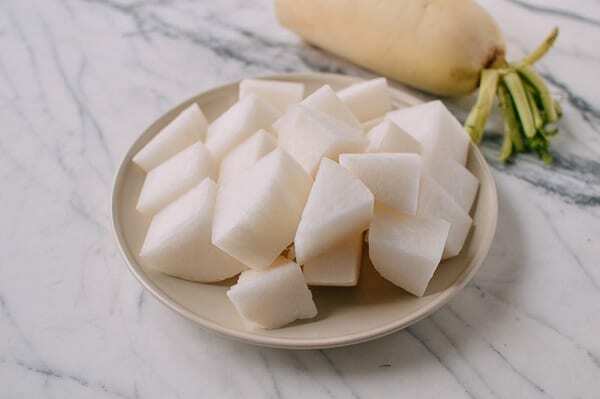 Once the Instant Pot is safe to open (pressure is fully released when the float valve has dropped back into the lid), open it and add the radish chunks. Stir to combine with the beef. 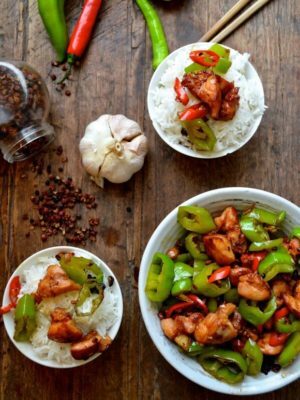 Is this able to be done in a crock pot? 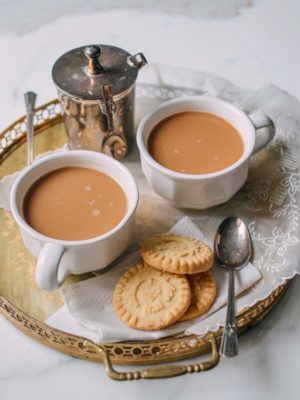 Hi Yasmeen, probably, but I really am not sure how long it would take, and you would probably also need more liquid to make this in a crockpot (some beef stock or chicken stock would work). 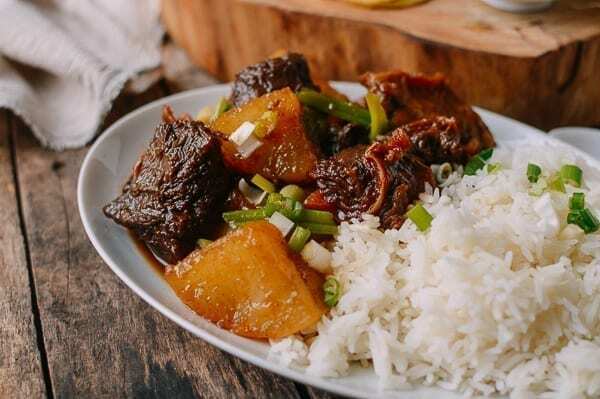 This is an instant pot recipe, which requires much less liquid due to the fact that everything is sealed and cooks under pressure. Feel free to experiment though! im confused youre saying the only liquid you add to the whole recipe is 1/4 cup of water or stock? youre not suppose to like fill up the whole instant pot with water? how would i adjust this if i wanted to make a max big batch in my 6 quart instant pot for my whole family? Hi John, filling the instant pot with water will result in a soup! 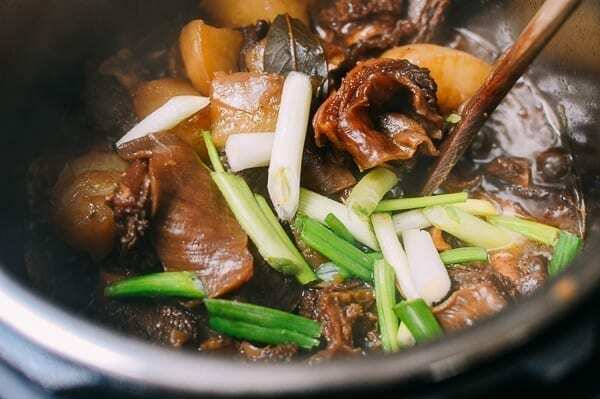 One cup of Shaoxing wine is enough liquid to cook the beef, since the instant pot is sealed when cooking. 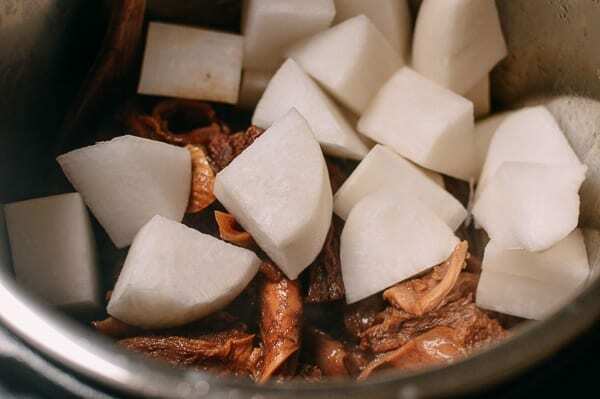 The beef also has moisture that will remain in the pressure cooker rather than evaporating off, and the radish pieces will also release liquid. 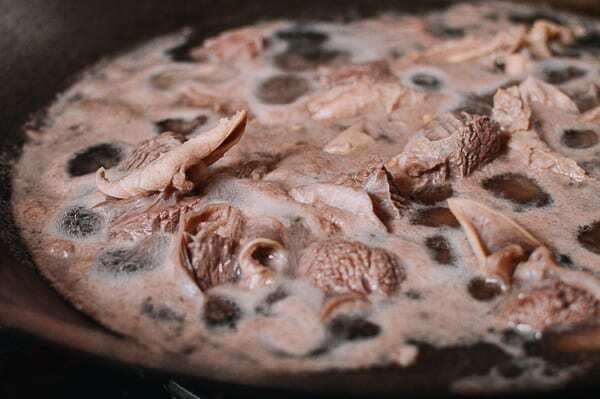 Have you ever added foo jook to the stew? Also, thank you for all your wonderful recipes. I especially appreciate the commentary on the various brands of sauces. There were a few I though were new and then immediately recognized the taste. Awesome food memories! 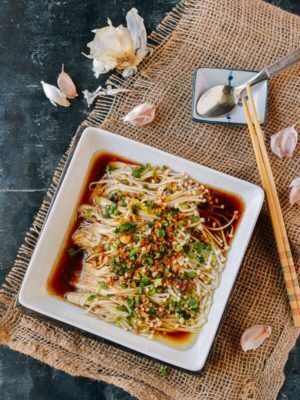 Hi Erika, I don’t remember that we ever made this dish with foo jook but it is almost always a great addition to any stew. I don’t have an instant pot. How long to simmer in a regular pot on the stovetop? Hey Karen, this will take about 4 hours on the stovetop––perhaps longer, depending on the rough flank you get. Thank you! 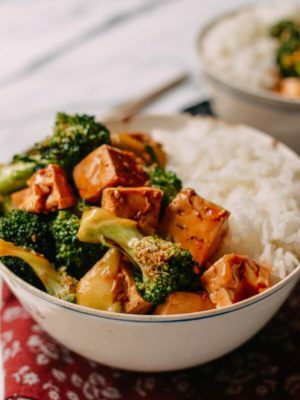 I made this the other day with my instant pot and it was phenomenal! The meat was tender yet absorbed all the flavour from the seasoning. I was thinking to swap sugar with rock sugar next time to get more of a caramalised source. Me and my husband had this for 3 straight days and we still haven’t got over how good it was! On a side note, I grew up in HK, now living in London. 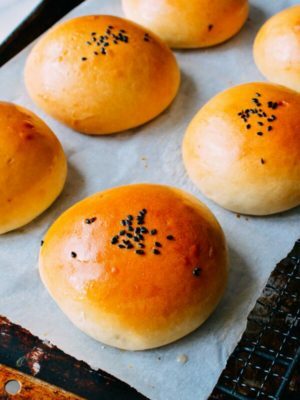 This website is the only one that I use and trust for Asian recipes. 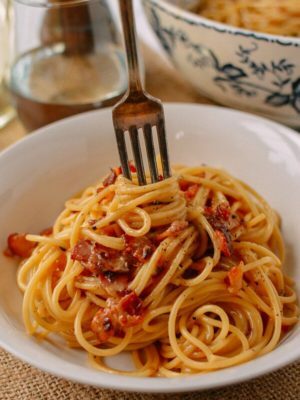 It doesn’t water the recipes down and shows how food would be cooked back home – which I love. Thank you and keep this up! 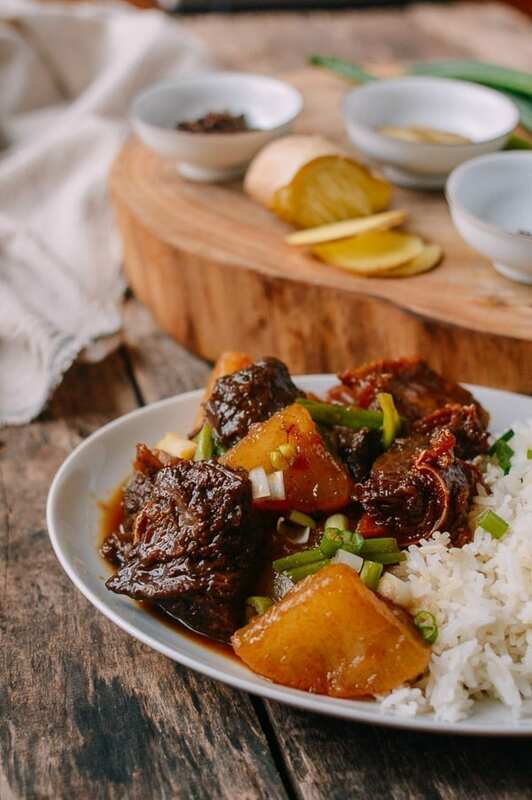 There is an E X T R E M E lack of Q U A L I T Y Instant Pot Chinese Genuine Recipes available online. (most notably for reason i’ll not go into here). I am glad to have come across the authenticity, reproducability, and superiority your selection of available resources to draw from. 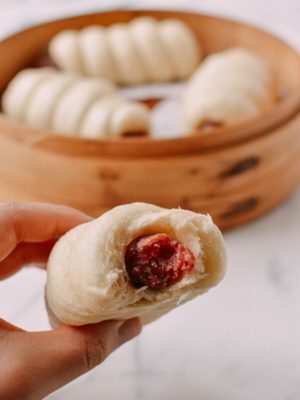 This most recent recipe, an additional goto for the ” I cant make it into lower Manhattan, but am craving something from there, that I can do in an Instant Pot. where i’m stranded…” is great. P L E A S E more quality IP recipes like these. 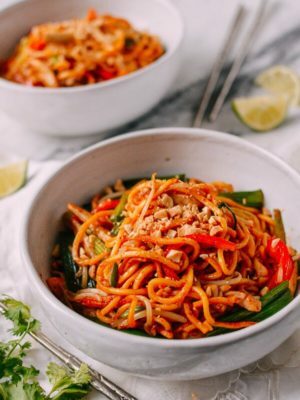 We definitely have more Instant Pot recipes on the horizon! 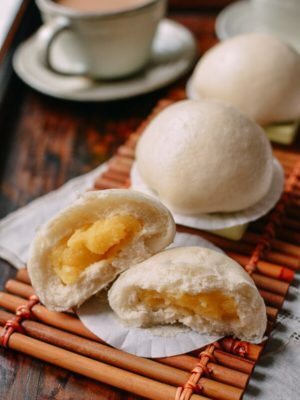 Is there a suitable non alcoholic replacement for Shaoxing wine that would still make this dish awesome? I’m wanting to make this for my Muslim relatives who do not take alcohol. I read that Apple juice or white grape juice may be possible substitutes but not too sure! And I enjoy your family blog a whole lot! Thank you for all the joyous food, adventures and sharing! 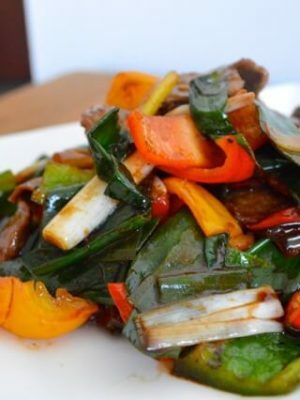 Hi WeiLing, you can omit the Shaoxing wine and replace it with slightly more ginger, garlic and onion. Noting that the recipe called for one cup of Shaoxing wine, do I need to replace with some water or stock? Your style of cooking and writing hit all the right notes in me! Sounds crazy I know but I am also Asian, Vietnamese to be exact. Reading your blogs somehow brings me back to Viet Nam of yesteryear. 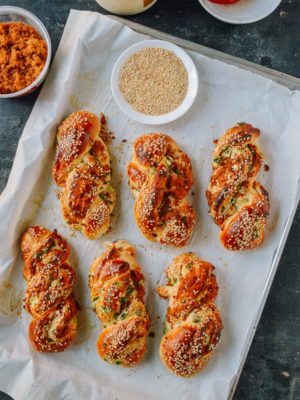 The recipes you share here are somewhat similar with what we were brought up on. 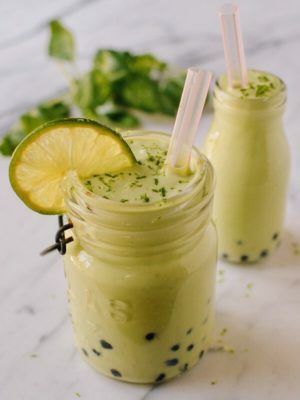 Living in the US in the last 44 years, I’ve never ceased to stop searching/ reading for more information about Vietnam, be it politic, foods, culture….you guys are like the cousins I wish I had! Ones who are inquisitive, adventurous …..and all around fun to be with. Not ones who are so gung-ho about becoming doctors, dentists, making tons of money and everyone else be d… if they are not up to their levels. Don’t get me wrong, there is nothing wrong with becoming doctors, dentists… but there are more to life than just making tons of money. Stop and smell the flowers and reading your blogs, for example. There is a whole new world out there to explore. I’ll get off my soap box now. Please keep up with your blog. We love it!